The last day of every month is usually a special day. A day to give thanks to God for his sustaining graces in our lives from the beginning of the month till the last day. For Most Rev. 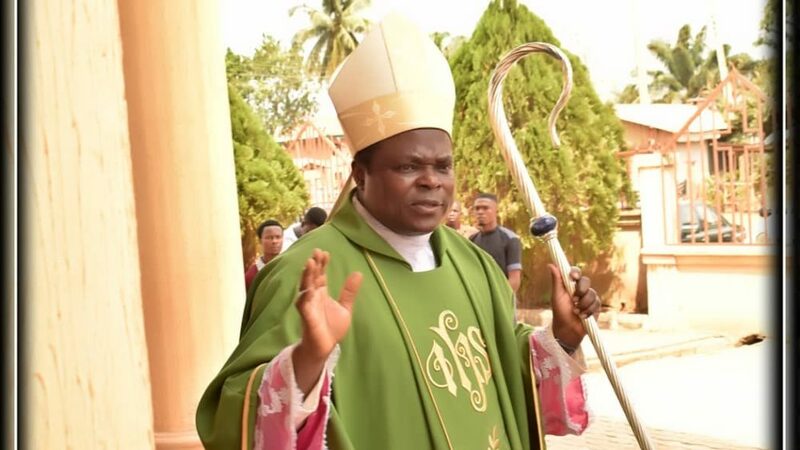 Donatus Ogun, the Bishop of Uromi Diocese, the last day of the month of January is special for another reason. It is the day of his Episcopal ordination Anniversary. He was ordained Bishop of Uromi Diocese on Saturday, 31 January 2015. On the occasion of his 4th Episcopal Ordination Anniversary, His Lordship got a surprise package put together by the Members of the Bishop’s Household. Coming down for Mass on that beautiful morning, he was surprised to find in his Chapel all the Members of his Household, a good number of priests including the Vicar General of the Diocese and Consecrated Persons from some of the religious congregations in the Diocese. Yes. It was a real surprise. For the Bishop, that was not expected since Thursday, 31 January was to be like a regular working day for him. In fact, on his schedule for that day was Curia meeting at the Chancery at 10:00 am. At the Thanksgiving Mass which commenced at exactly 8:00 am, the Bishop who was overwhelmed by this surprise package was short of words. He was all smiles. Having processed into the Chapel and having seen the Chapel filled to capacity, he was deeply moved to see the chapel filled with some of his faithful who had come to pray for him and with him on his 4th Episcopal Anniversary. He had to, in fact, wait for a couple of minutes to overcome this surprise before continuing with the Holy Mass. The Episcopacy is an uncommon blessing, an unmerited favour. This was the assertion made by the homilist, Very Rev. Fr. 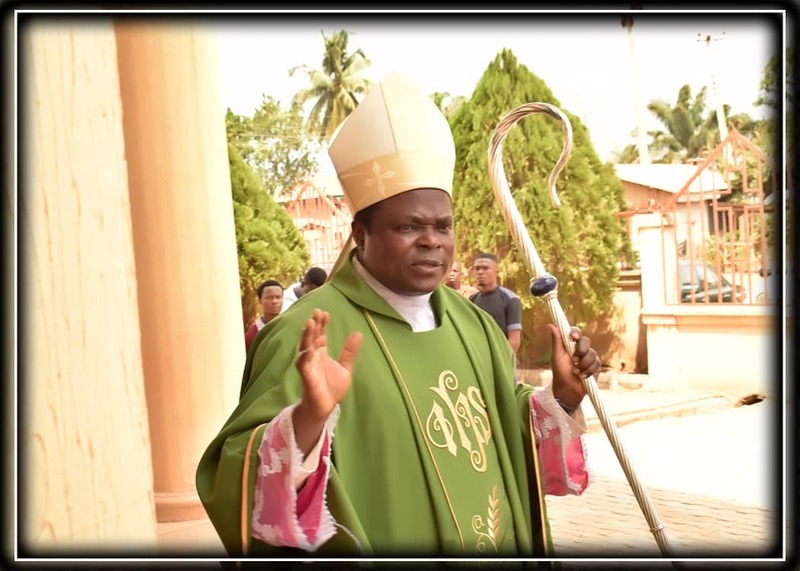 Wisdom Obiajunwa, SDV, Vicar for Religious, Uromi Diocese. This is what motivated and justified our Thanksgiving on that day. The homilist noted that in four years, his Lordship has achieved a lot as Bishop of Uromi Diocese. He has built a lot of pastoral and physical structures. In the last few months, he has created seven more autonomous Churches in the Diocese and provided them with resident priests to attend to the spiritual needs of the faithful. He is, by all standard, a competent administrator, a leader with vision, an orator, an academic and a spiritual guru. He concluded his homily by praying for more wisdom, strength and grace from God for the Bishop that his labour may continue to bear more fruit. While appreciating, on behalf of the members of the Bishop’s Household, all those who at a very short notice were able to come for the Thanksgiving Mass, Rev. Fr. Gregory Abuya, the Secretary to the Bishop prayed that God may continue to bless our dear Bishop, bless Uromi Diocese and bless Esanland. In his words of gratitude after the praying assembly joined him in singing the Magnificat in thanksgiving to God, the Bishop thanked everyone for coming to pray with him. He expressed his gratitude to God for his sustaining graces all through the years. He asserted that he is always overwhelmed by the sacrifices of his priests, the consecrated persons and the lay faithful with whom he is so pleased. We wish his Lordship good health, wisdom and strength as he grows in his ministry as Bishop. May he continue to find joy and peace in his episcopacy. May he be blessed always with collaborators who will make the burden of his office lighter. Above all, at the end of our earthly pilgrimage, may he have a share with all of God’s people whose shepherd he is in the eternal kingdom of our God. Amen. Ad multos annos, Sacerdos Magnus noster!